These morsels were introduced last year, but demand grew so furious that the maker went underground for a while. He'd still prefer that no one know his name, but his Macadamia Nut Okoshi is in good supply for the holidays at Pat's Island Delights. 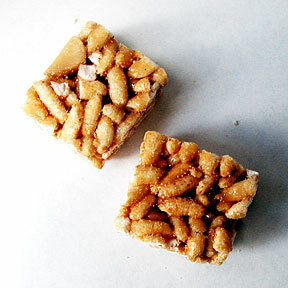 Okoshi is a traditional Japanese snack, made with puffed rice cereal and peanuts, but this version uses puffed brown rice and mac nuts. It's surprisingly light, crisp and not too sweet. Pat's owner Pat Ohta says it's been a hot seller. Pat's is in Pearl City and downtown at the Davies Pacific Center. Call 484-8808 or 536-1414.